Holy crap it’s the Mana Pool! Because you asked for it (well, at least a couple of you asked for it) this is an Out of the Deck Box episode! We’re taking a look at Mike’s mono-white Wrath of Emeria deck in all its world-destroying glory. Then Dirk cries havoc! and lets slip the Slivers of war. Brian is up next with his Grixis-colored Phyrexia-aligned Rage Extractor deck, which made its first appearance at our last gathering. 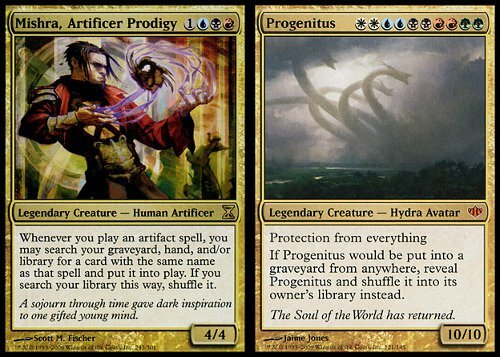 I bring up the rear with a look at my Progenitus Commander deck, with a name that I blatantly stole from Claire, formerly of the Avant-Card Show. Of course, that’s not all we did this episode. We took a look at the decks that were at the top of the standings at US Nationals, with their pigeons crapping all over everything and giving people meningitis. And while Brian was away on baby care duties, we went over some emails, of course. We always have emails. And because I’ve patterned my podcasting manner (loosely, of course) after Kermit the Frog, the music is from The Muppet Show. Oh yeah. This entry was posted in Podcast and tagged casual magic, Magic the Gathering, MTG, out of the deck box, podcast, The Mana Pool. Bookmark the permalink. Follow any comments here with the RSS feed for this post. Post a comment or leave a trackback: Trackback URL. Mike – for your Wrath of Emeria deck, since you’re considering taking out the Blinking Spirits anyhow, have you considered Kor Duelists? They just work so perfectly with any of the Sword of X and Y cycle, they’re low on the curve, and double strike as an ability is strong enough that you don’t mind seeing one late-game either. You’re right about the value of double strike with respect to the Swords. I got a comment on the Tapped Out page for the deck suggesting adding Mirran Crusader. Since his built-in protection will makes him absolutely crazy in combination with one or more swords, I think I’m going to go with that as a replacement for the Spirits. I think I default to cheaper options since I’m still somewhat on the broke-college-student budget. And there is a lot of dudes fighting over that 1-drop slot I guess. Yeah…War & Peace on the Crusader is just…terrifying. So is Fire & Ice. Makes sense. Resource constraints are totally understandable. That’s one of the biggest factors in all my deckbuilding choices, and I always try to trade for cards I don’t have rather than buy them. It just happens to be that 3 Crusaders have been chillin’ in my trade binder for quite some time, and I’ve been meaning to do something with them anyway. Crusaders, never underestemate them. The meanest trick I’ve seen was where a Crusader swung against an opponent (me) with two swords attached. Playing my lifegain deck, I could take the 12 damage with other effects. So I take that. And then out comes a tainted strike. ouch. Mirran Crusader has pro black, brah. Yo’ were robbed. For the WUBRG EDH deck, you should consider Door to Nothingness for sheer awesomeness.